Purim is the perfect holiday to celebrate with students on the college campus, unless of course, if Purim falls during spring break, which is just what happened this year. 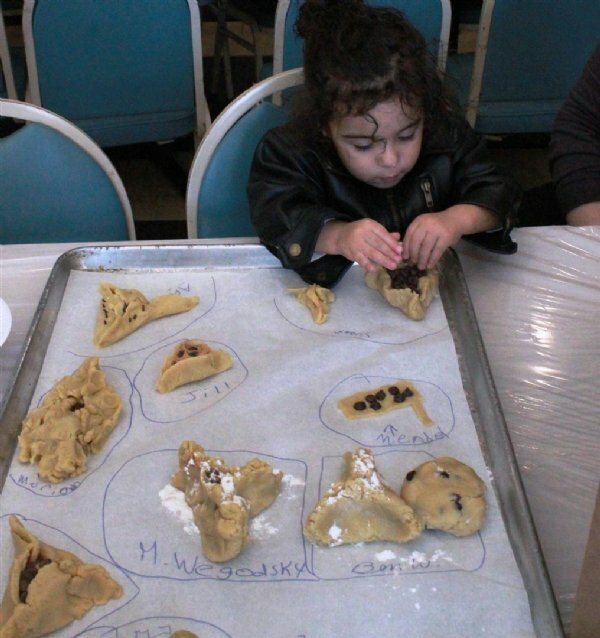 With the Rutgers break coinciding with Purim, a decision had to be made what would happen this year for this festival. So, Rabbis Baruch Goodman, Shaya Shagalow and Shraga Crombie all sat down and wondered what would happen if word would go out to the local town that there’d be a Megillah reading and program for area children in the New Brunswick vicinity? Asking around, it didn’t look good. 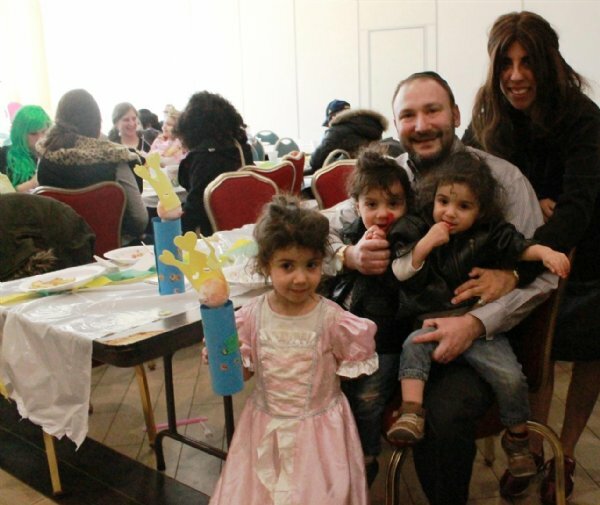 Since Purim was to take place this year on a Sunday, all the local people who were asked had plans, and it didn’t look like anyone would come. 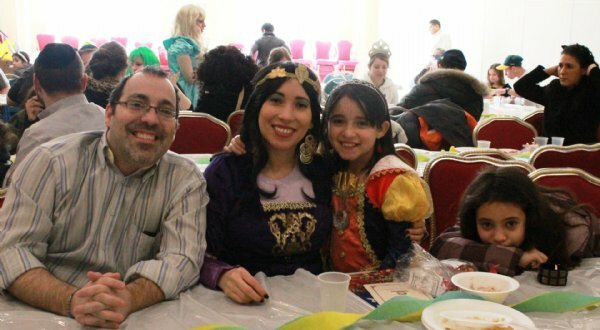 But the rabbis were persistent, and sent out the “royal decree” that spring break or no spring break, Chabad at Rutgers was making Purim! Not just on Saturday night for the few students who hadn’t left for break yet, but on Sunday as well. 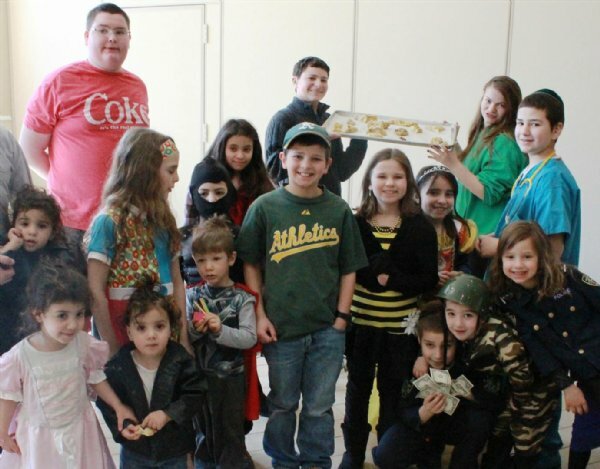 Facebook and Twitter posts were made, as well as postcards and emails sent out to families in the surrounding areas, advertising a Grand Purim Breakfast Feast Sunday morning, with Megillah reading, and Purim Festive Meal, Hamantaschen baking, a Purim raffle, and prizes for all children dressed in costume. 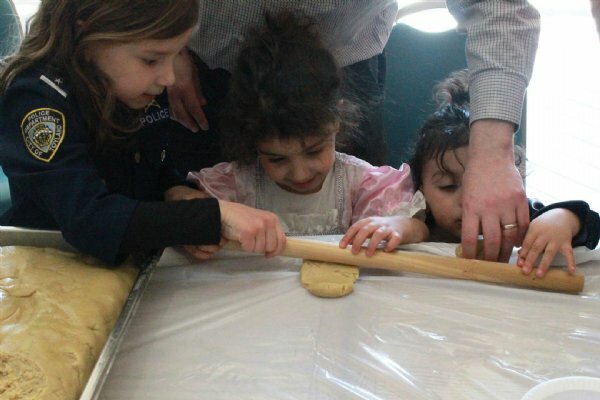 When the day came, the Chabad House was bustling with activity, preparing for the 8 or 80 people anticipated. 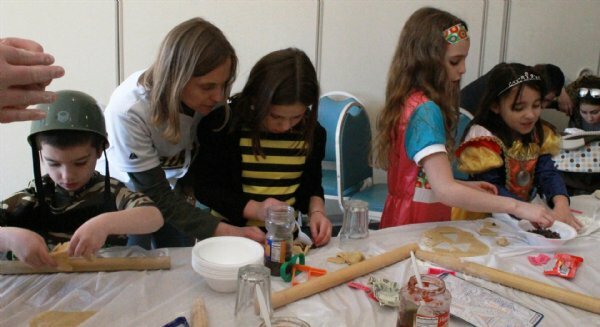 Megillahs and graggers were set in the Shul, prizes were purchased, a continental breakfast with eggs, pancakes, lox, whitefish, bagels, rolls, yogurts, fruits, and juices was prepared, and hamantaschen cookie dough made. And then the front doors began opening, over and over again. Parents and children came from New Brunswick, Piscataway, East Brunswick, South River, Highland Park, Edison, Metuchen, and even from RWJ Children’s Specialized Hospital. The welcome desk recorded exactly 79 entrance tickets. Rabbi Goodman’s children helped set up the Shul and breakfast Purim feast, Rabbi Shagalow, who read the second reading of the Megillah, brought the Mishloach Manot kits made by student leader Esther Shimonovich and her volunteers, while Rabbi Shraga Crombie read a lively rendition of the Book of Esther to a very receptive and enthusiastic audience. 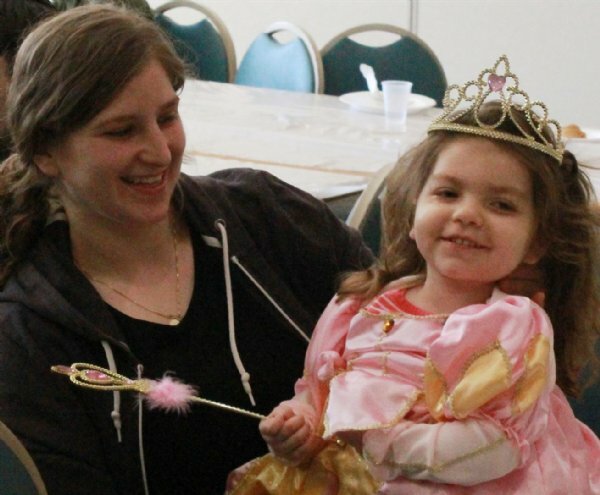 Melanie Wegodsky, a graduate of the Chabad Hebrew School, who attended with her mother and brothers, helped lead the children’s raffle and prize distribution for all children in Purim costumes. Towards the end of the program, as freshly baked hamantaschen were being taken out of the oven, Mishloach Manot kits exchanged, Tzedaka given to the poor, and raffle prizes distributed by Melanie, the front registration table welcomed in one more participant – Melanie’s father, Jay, who had gone to work extra early in the morning to be able to spend the rest of the day of Purim with his wife and children, bringing our total ticket count Purim day to 80!